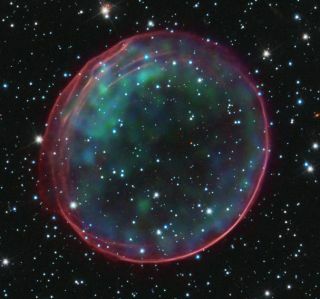 his image of the Type 1a supernova remnant 0509-67.5 was made using data from NASA’s Hubble Space Telescope and Chandra X-ray Observatory. Analyses of Type 1a supernovae's motion through space has led astronomers to conclude that the universe’s expansion is accelerating, driven by a mysterious force called dark energy. Paul Sutter is an astrophysicist at The Ohio State University and the chief scientist at COSI Science Center. Sutter is also host of Ask a Spaceman, We Don’t Planet, and COSI Science Now. Sutter contributed this article to Space.com's Expert Voices: Op-Ed & Insights. Newsflash: the universe is expanding. We've known that since the pioneering and tireless work of Edwin Hubble about a century ago, and it's kind of a big deal. But before I talk about dark energy and why that's an even bigger deal, I need to clarify what we mean by the word "expanding." This recession is seen in the redshifting of light from those galaxies. The fingerprint frequencies of certain elements are shifted down to lower frequencies, exactly like they are for the Doppler effect. But to explain the cosmological observations as a simple Doppler shift requires a few head-scratching conclusions: 1) We are at the center of the universe; 2) Galaxies have preposterous mechanisms that propel them through space; and 3) The universe conspires to make galaxies twice as far away from us move exactly twice as fast. That seems like a bit of a stretch, so astronomers long ago reached a much more simple conclusion, one powered by the newfangled general theory of relativity: the space itself between galaxies is expanding, and galaxies are just along for the ride. Edwin Hubble established the expansion of the universe by cataloging nearby galaxies (after discovering that there is such a thing as "nearby galaxies"). But the story of dark energy doesn't get told by neighborhood redshifts. The game of cosmology in the latter half of the 20th century was to go deep. Way deep, which is challenging because deep-space objects are a little dim. Thankfully, nature gave scientists a break (for once). A certain sub-sub-subclass of supernova explosions, known as Type 1a, has two useful characteristics. Because Type 1a supernovae tend to happen from roughly the same scenario — a white dwarf accretes gas from an orbiting companion until a critical threshold is reached, a nuclear chain reaction goes haywire and boom — they have roughly the same absolute brightness. By comparing the observed brightness of a Type 1a supernova to the known true brightness (calibrated using handy nearby sources), a little high-school trigonometry reveals a distance. But wait, there's more! Since Type 1a supernovae contain the same mix of elements, we can easily identify their fingerprint frequencies and measure the redshift, and hence a speed. Type 1a supernovae are relatively rare — only a small handful will light up each galaxy every century. But since there are so many galaxies in the universe, they're constantly popping off somewhere. And they're insanely bright, too. For a few weeks, a single explosion can outshine its entire host galaxy. That's hundreds of billions of stars for those of you keeping track. As the light travels to our telescopes from a distant supernova, the expansion of the universe will stretch it out to longer wavelengths. The further in the past the supernova exploded, the longer the light has traveled to reach us, and the more stretching it has accumulated. So a single supernova redshift measurement gives us the total amount of universal stretch in the intervening billions of years between us and the explosion. By performing multiple measurements at multiple distances, we can build a cosmic growth chart, mapping the expansion of the universe as a function of its age. And that's where dark energy enters the fray. In the 1990s, after a decade of technology development, the stage was finally set for supernovae to shed some light on the expansion of the universe. Specifically, its deceleration. In a universe full of matter, the expansion should slowly be wearing out as its gravitational pull tugs back. We didn't know how much matter was in the universe, but a measurement of the cosmic growth chart would help pin it down. At first the results were promising: two competing groups both provided initial results of a detectable deceleration rate, but with necessarily large error bars (they were just getting started, after all). But in the coming months, things started to go downhill. As more supernovae data came back from the surveys, the measured deceleration shrank. Then vanished. Then reversed. It appeared that the expansion of the universe was accelerating. Both groups frantically tried to figure out the bugs in their data-analysis pipelines. Surely something was amiss, and each was worried that the other group might steal its thunder by publishing a sound measurement while it was still fiddling with its codes. But the data refused to budge. Nervously, cautiously, the groups reached out to each other: "Do you see what we see?" It was then that the groups began to appreciate what the universe was telling them. Two competing teams, using different telescopes, different datasets and different methodologies, were independently coming to the same conclusion. Our universe wasn't slowing down, but speeding up. They published their work almost 20 years ago. In the meantime, after several independent lines of evidence all pointed to the same conclusion, they shared in a Nobel Prize for their unexpected discovery. The name for that observed phenomenon — dark energy — sticks with us today, but we still don't understand it. We don't know why the expansion of the universe is accelerating, but we do know that it does accelerate. Learn more by listening to the episode "Does Dark Energy Exist?" on the Ask A Spaceman podcast, available on iTunes and on the web at http://www.askaspaceman.com. Thanks to Mike N., @al_mcclintock, Philip A., Walt A., Cheryl B. and Vick K. for the questions that led to this piece! Ask your own question on Twitter using #AskASpaceman or by following Paul @PaulMattSutter and facebook.com/PaulMattSutter.